The Richmond Flying Squirrels baseball team announced its 2015 promotion schedule this week. The season opens April 9. The schedule proudly features 21 new and improved fireworks shows, 11 Free Shirt Fridays, 18 unique giveaways and 11 Kids Club Sunday’s with giveaways. 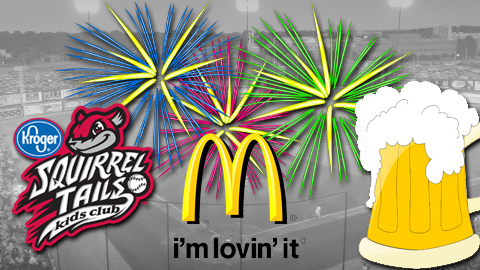 Fireworks displays will accompany every Thursday and Saturday night game at the Diamond, while Opening Night on April 9th will feature the Squirrels first ever “Dueling Fireworks Extravaganza”(simultaneous fireworks shows to occur on the field and in the traditional location). New for 2015 is the Squirrels Free Shirt Fridays and Happy Hour for all 11 Friday night contests. A different Squirrels themed shirt will be given to the first 1,000 fans and Happy Hour drink specials will be available from 5:30-7:30PM. The team will of course pay homage to the Giants championship success with a World Series Replica Ring (April 28th), Hunter Strickland Bobblehead (July 7th) and a Joe Panik “Panic Button” (July 21st). Squirrels Tails Kids Club Sundays are once again a focal point with this year’s schedule featuring giveaways such as the Nutzy Pillowcase (April 12th), Nutzy Toothbrush Holder presented by The Children’s Hospital at VCU (May 24th), and the always popular Nutzy Cape Giveaway (August 2nd). 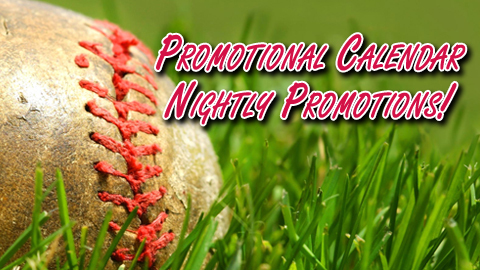 A full and detailed promotional schedule can be found HERE. Fans are invited to bring a McDonald’s receipt to the box office for any of the Squirrels eight Monday games and receive a buy-one-get-one ticket offer. Note that ticket prices will be increasing this year. General admission will cost $8 in advance and $9 at the gate, silver seats $10 in advance and $11 day of game, and field level is $12 in advance and $13 day of game. 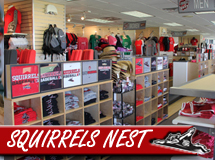 The Flying Squirrels baseball team shop, the Squirrels Nest, will hold a sidewalk sale this Tuesday, August 6 from 11am-5pm. Save up to 50% on visors, hats, t-shirts, polos and jackets. Sale items will be available online (there will be shipping fees) and at the Squirrels Nest shop at The Diamond. But of course I can’t help looking for more bargains at the ballpark. I found these two and will add them to the main Flying Squirrels deal post here. I’ve marked the location of the cheap seats above with a black arrow. As another school year ends, here’s a reminder of some of the reward programs that kids with good report cards can take advantage of! Flying Squirrels Score An “A” Free Ticket Program – For every “A” on your current K-12 report card during the 3rd and 4th marking period you will earn a FREE General Admission ticket to a regular season Richmond Flying Squirrels game! Each “A” on your report card is good for one ticket per game-if you receive 8 A’s then you’ll receive 8 General Admission tickets to 8 different games! Receive your free tickets by bringing your report card to our Front Office or Box Office! Ticket is good for student only. Free tickets are based upon availability. Courtesy of Union First Market Bank. (No longer listed on the website – discontinued?) Melting Pot Straight A Club – Do you have an honor roll student in the house? As school comes to a close we would like to recommend rewarding your students hard work with a FREE Melting Pot meal. If your child receives all A+’s, A’s or A-‘s on his/her report card you can bring that card in for a special dinner. For children in grades Kindergarten to 8th grade they can get a 3 course meal including cheese, entree (chicken, shrimp, teriyaki sirloin and ravioli) and chocolate. Those in High School (9th through 12th) can receive a four course meal. *An adult must accompany the honored student and at least one additional four-course dinner must be ordered to go with the free meal. Only one report card per reservation please. No other discounts/coupons can be used with this promotion. Valid only with the report card for this quarter. Not valid Friday or Saturday. We do offer this special feature year round so if they didn’t get all A’s this quarter they can always try again in the fall!